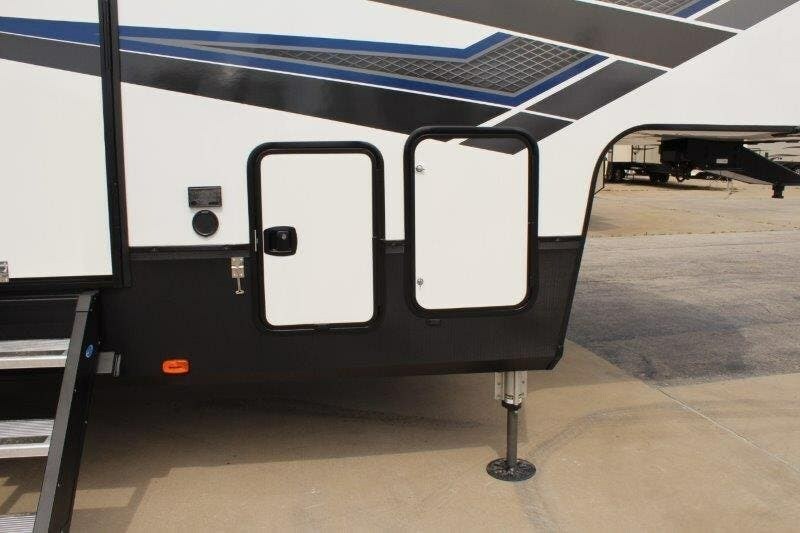 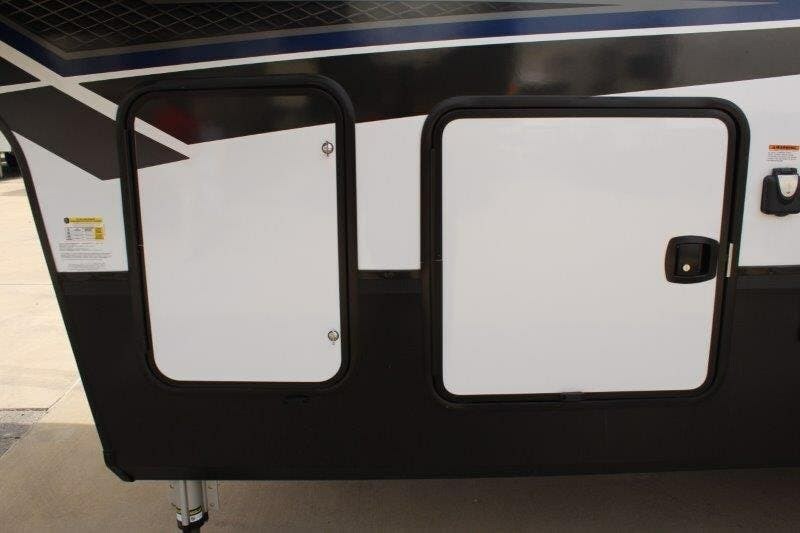 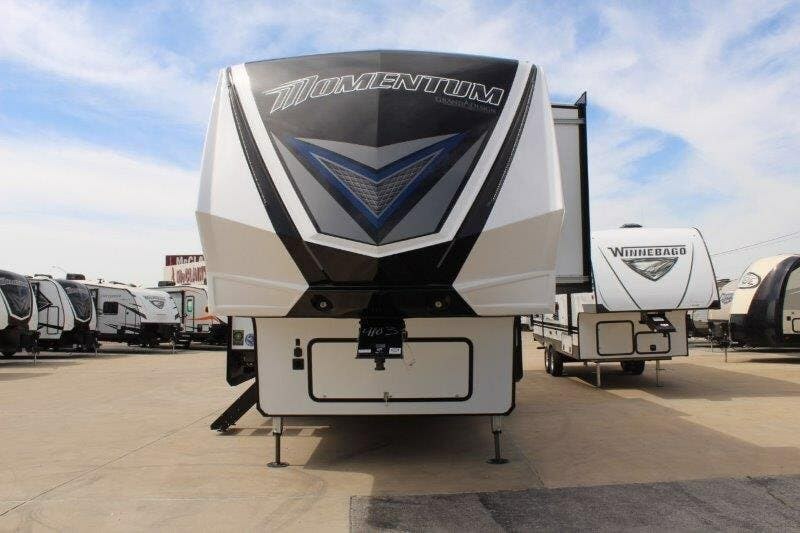 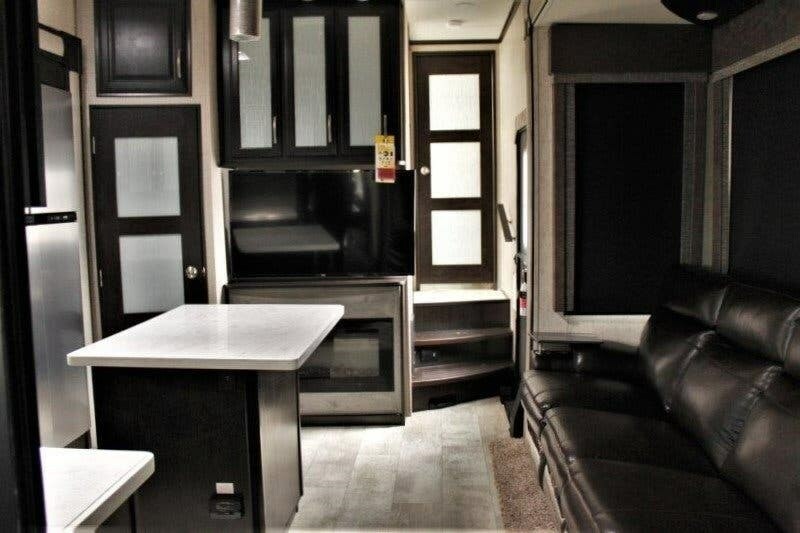 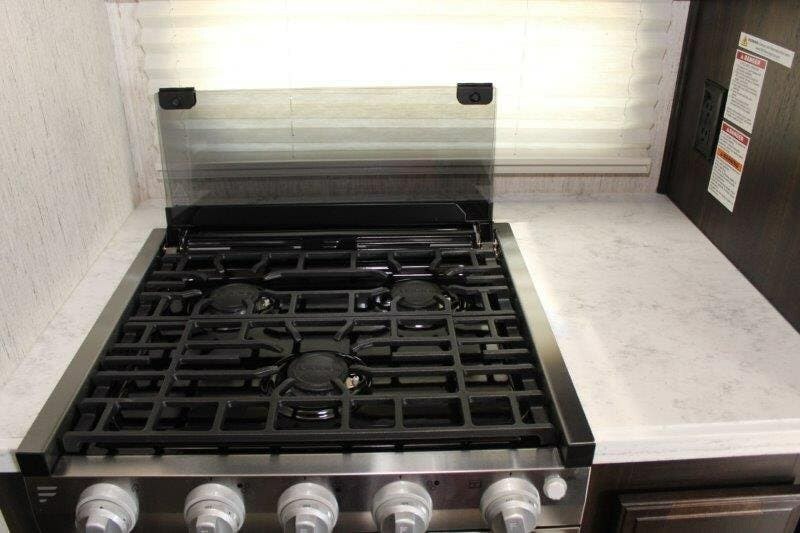 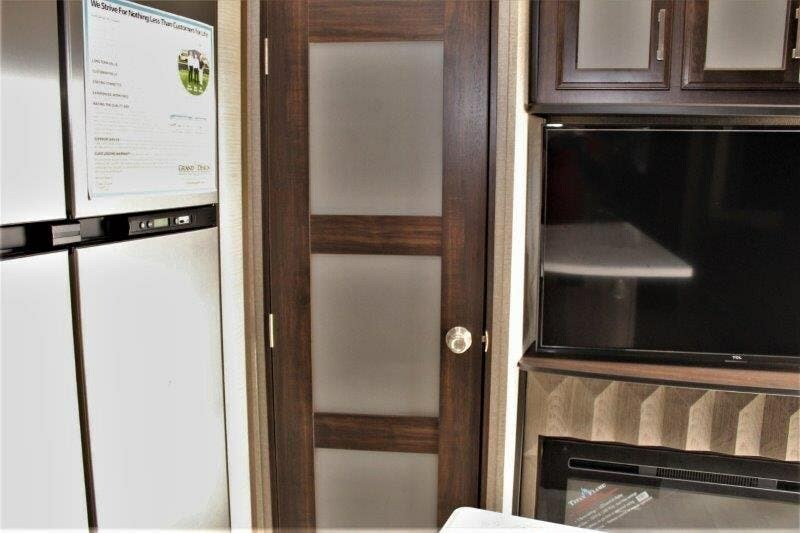 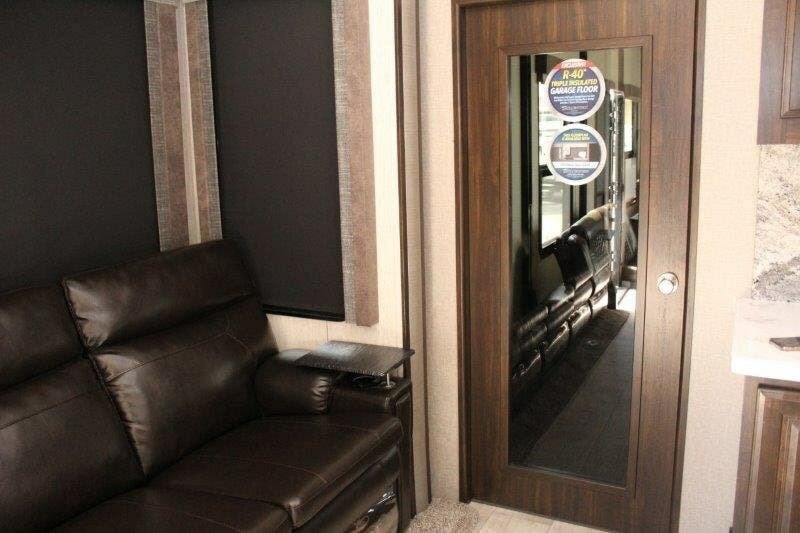 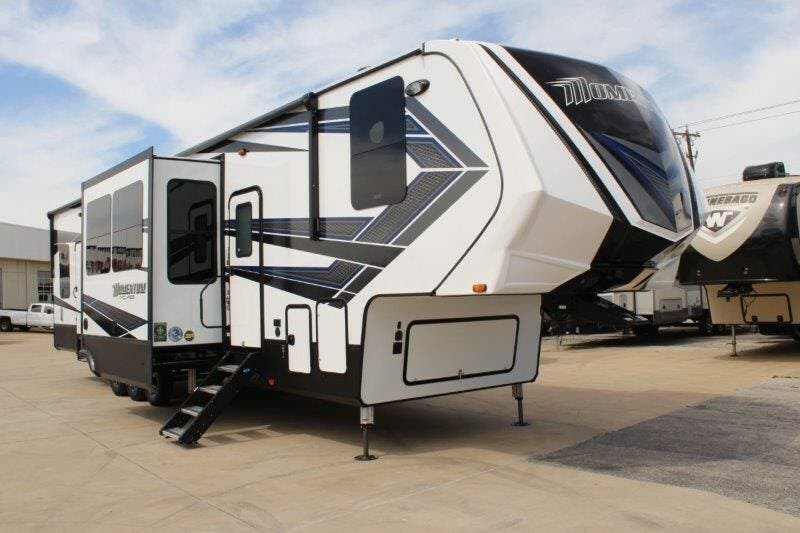 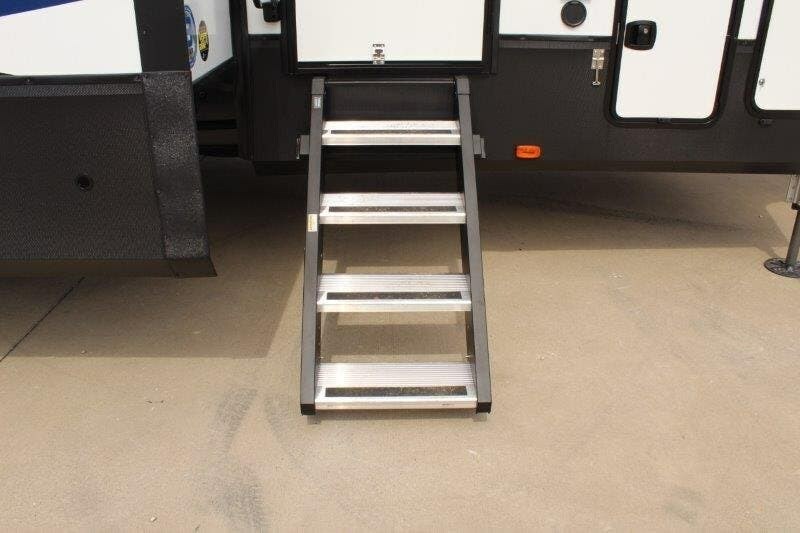 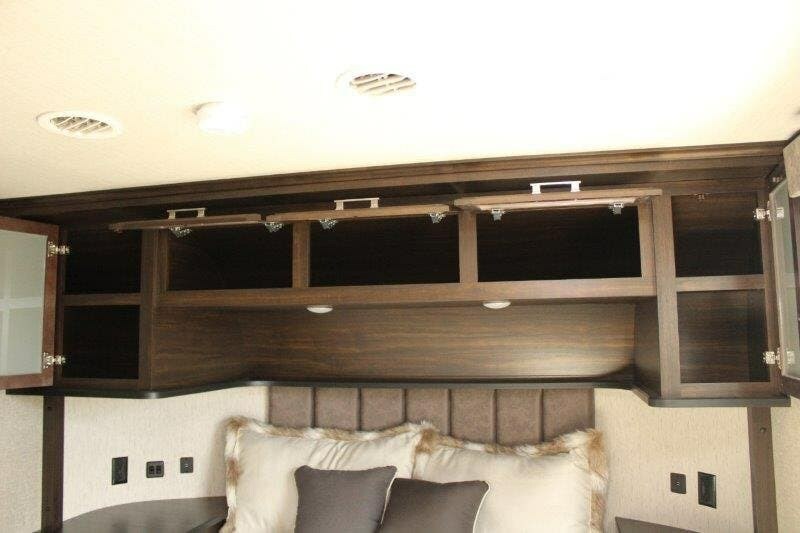 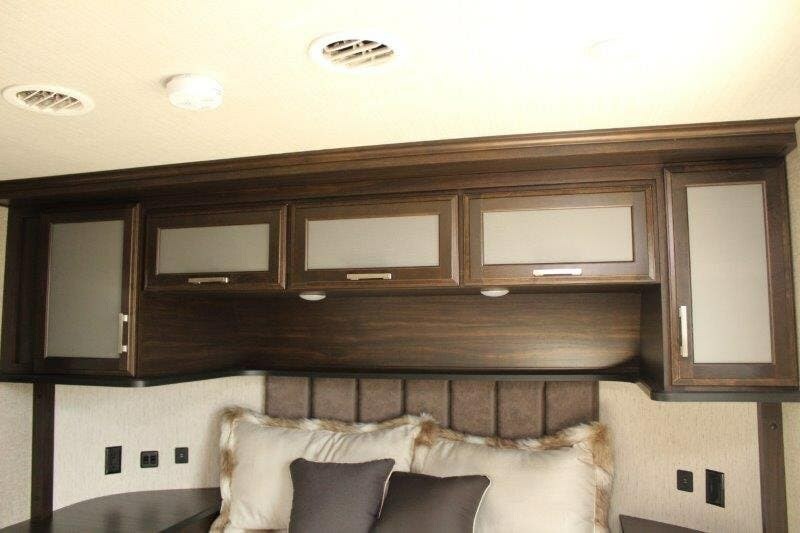 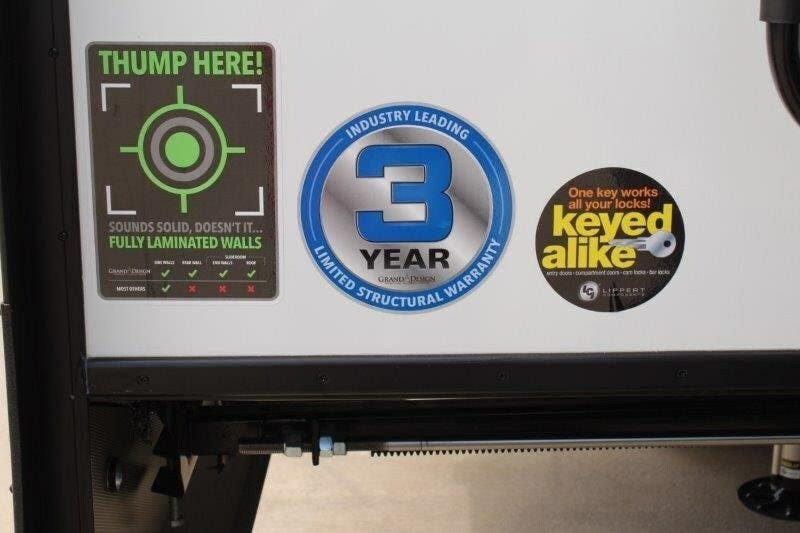 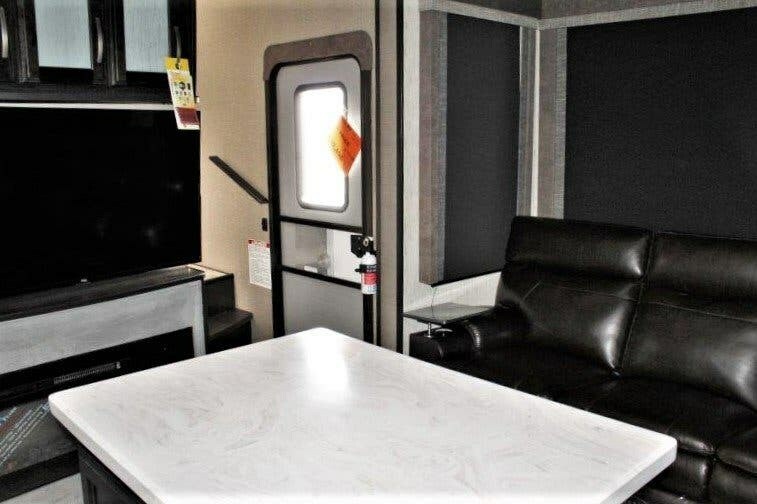 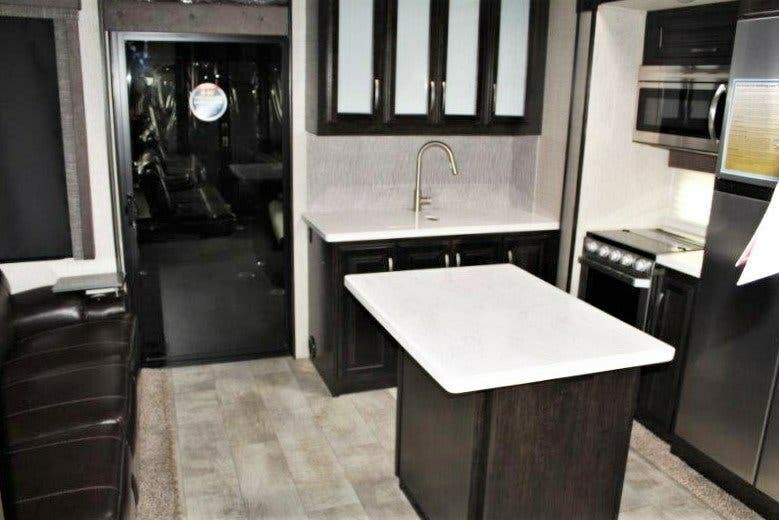 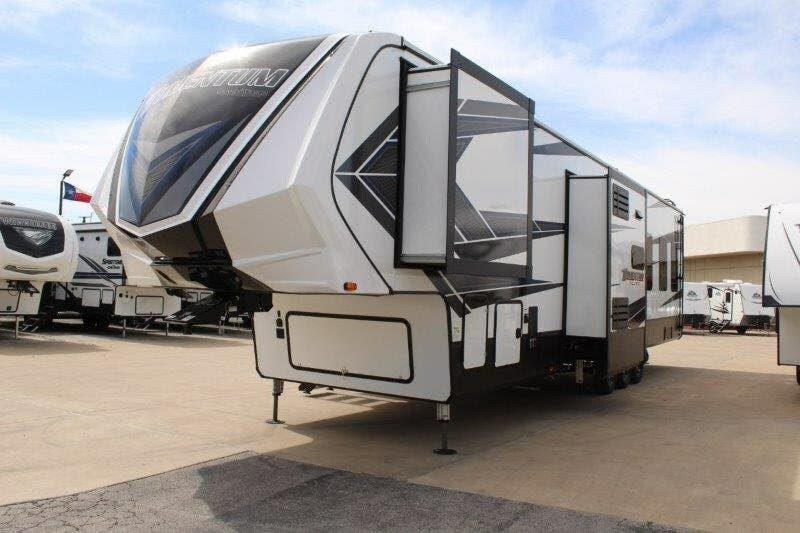 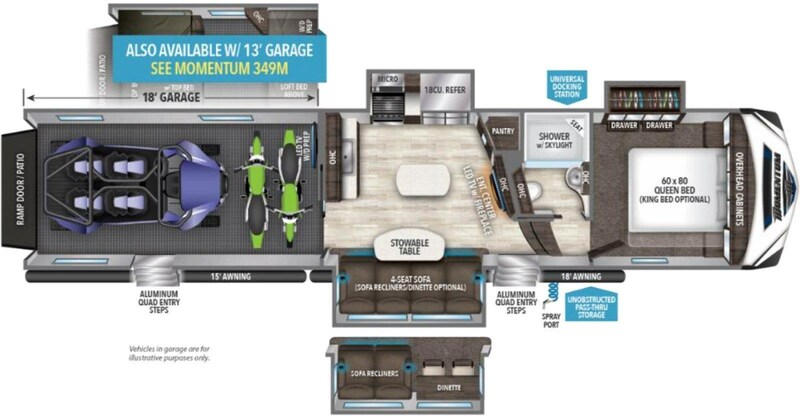 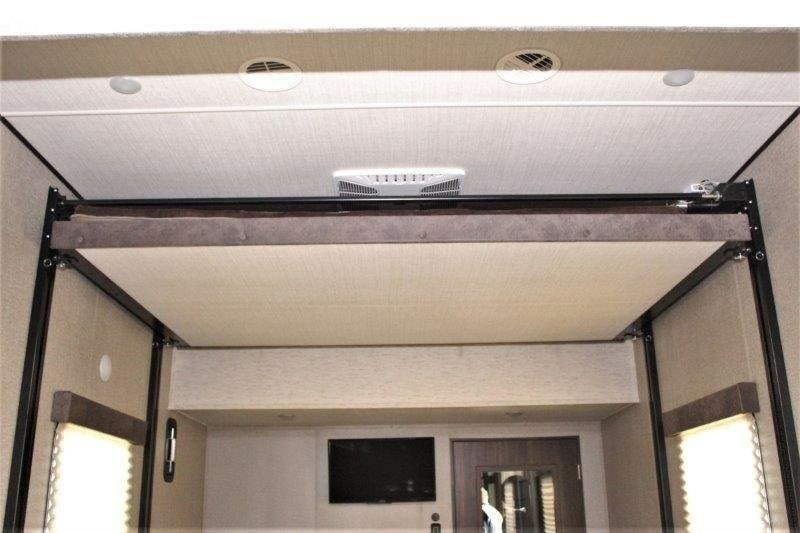 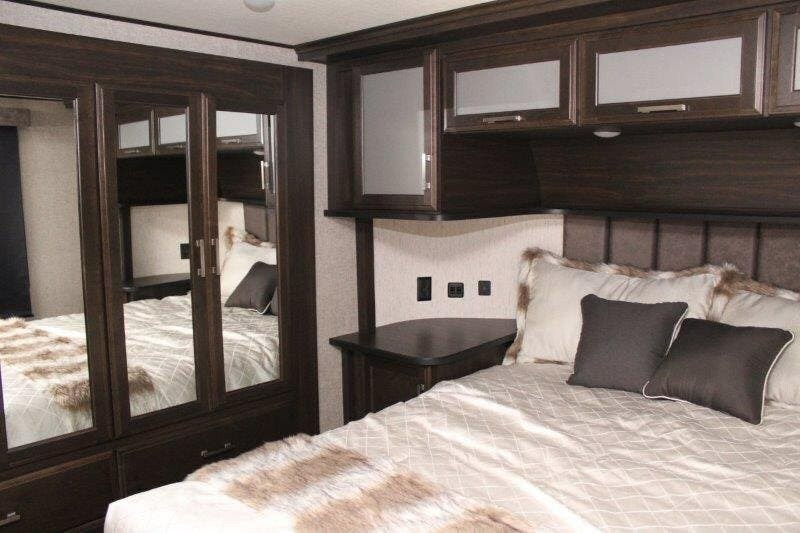 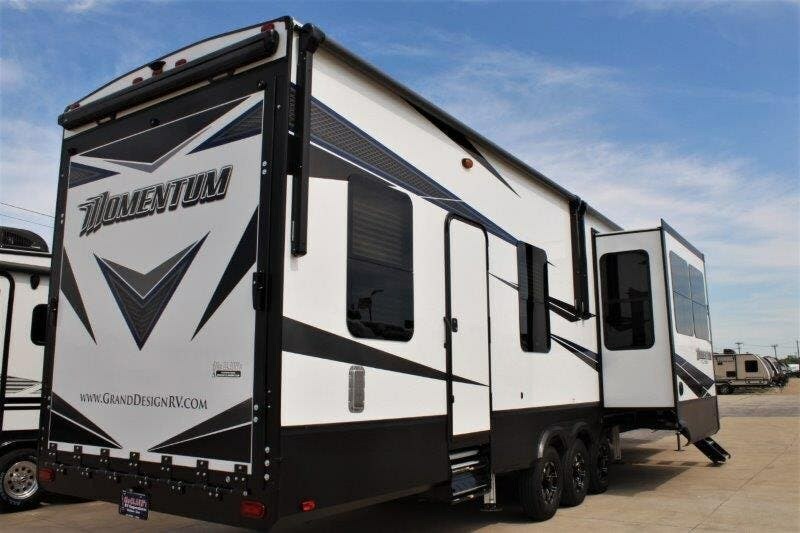 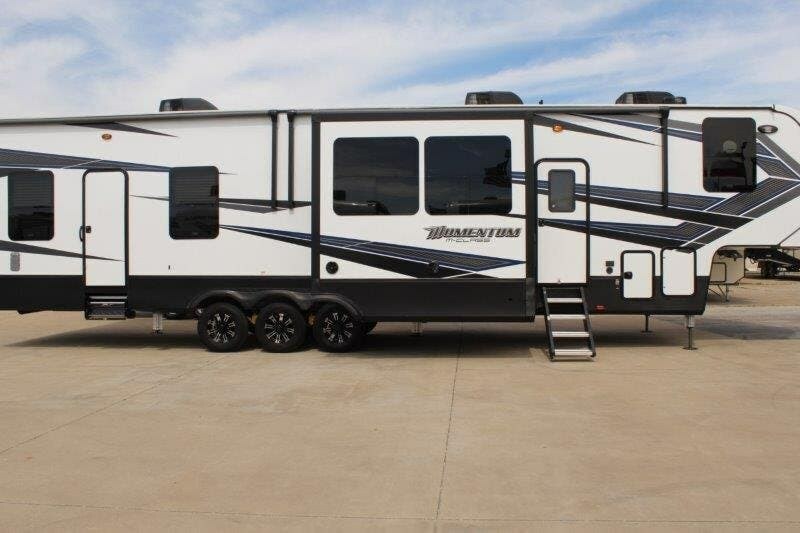 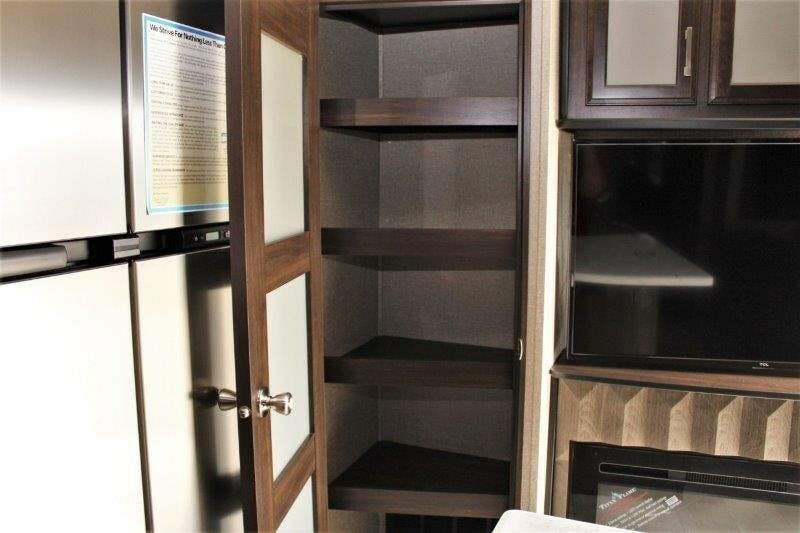 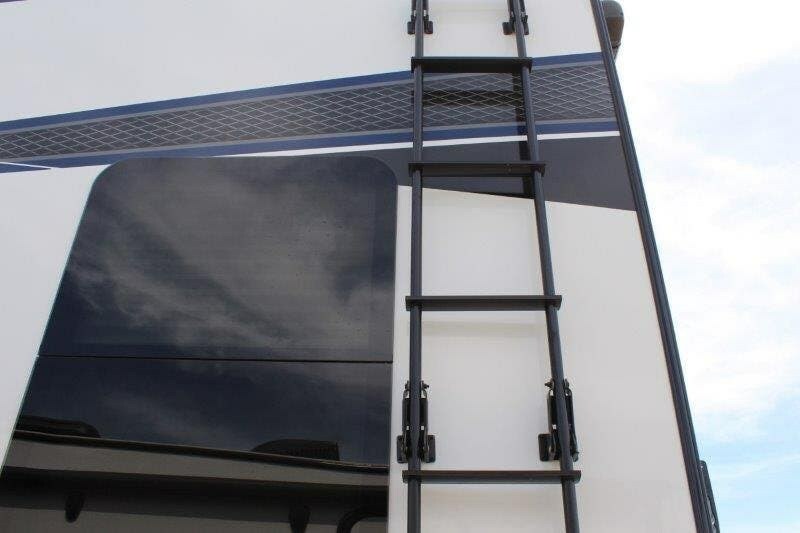 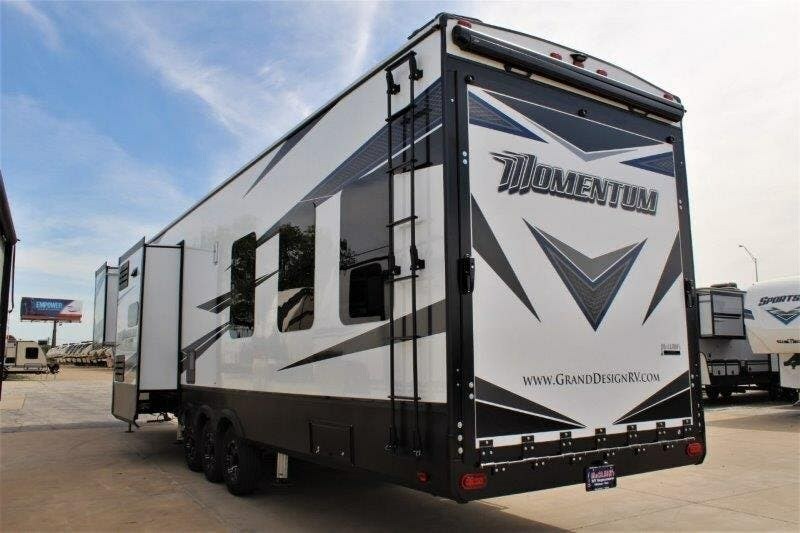 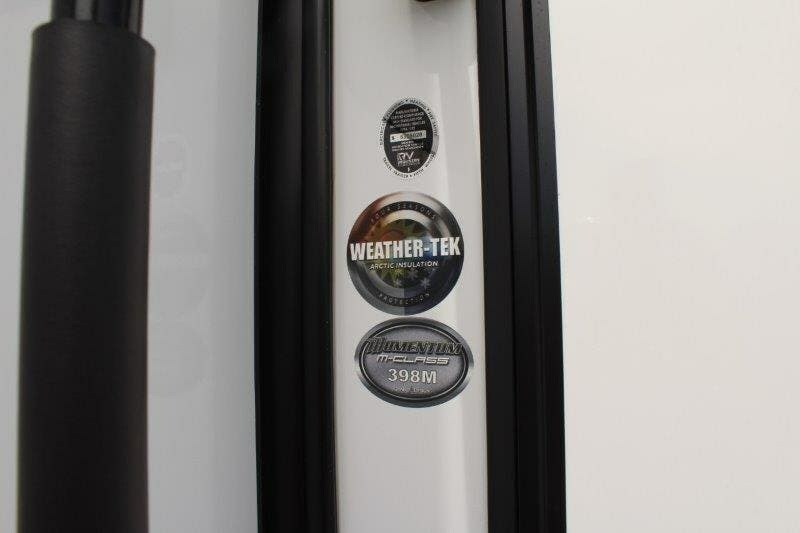 This Grand Design Momentum M-Class 398M toy hauler travel trailer features an 18' garage area including a loft, triple slides, a convenient kitchen island, plus a fireplace, and so much more!Step inside the cargo garage and find plenty of room to haul several of your favorite toys. 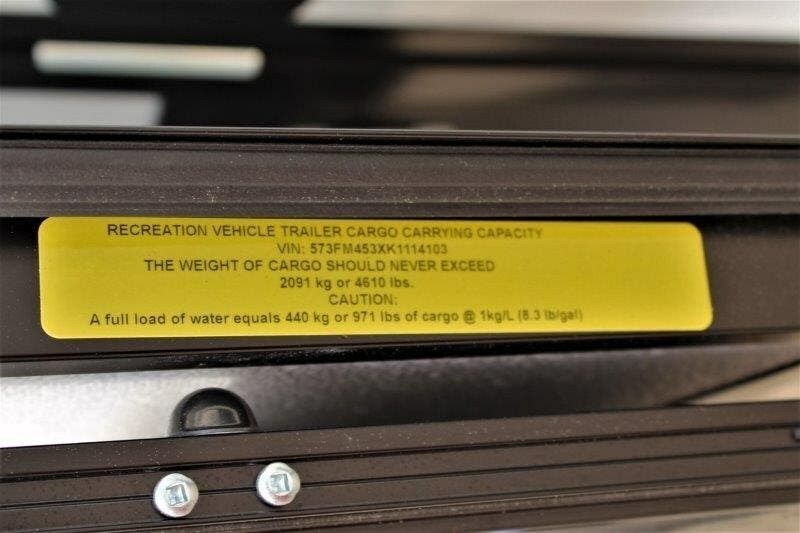 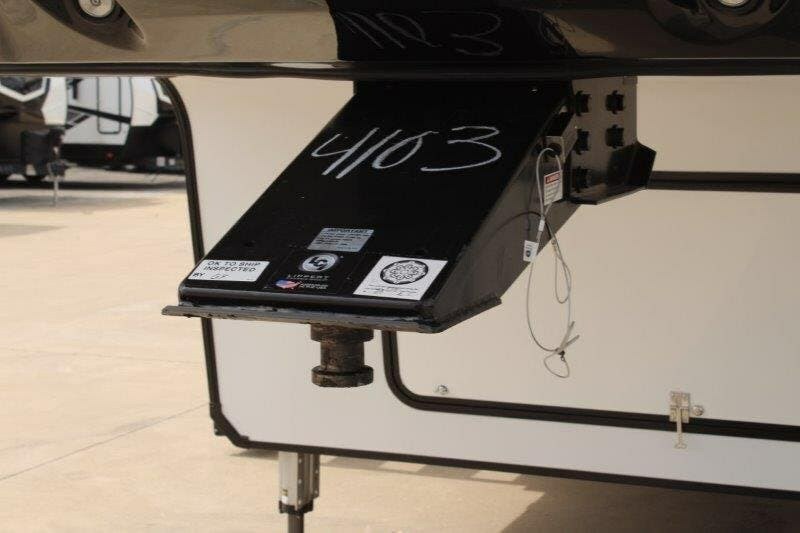 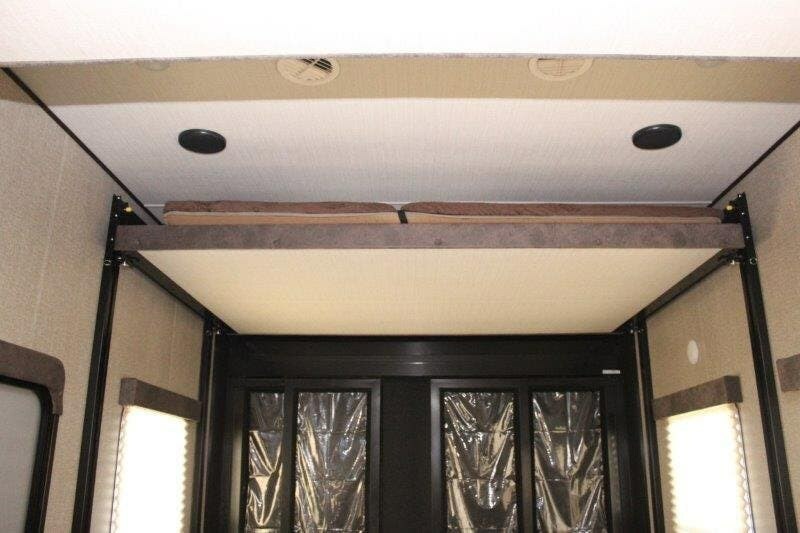 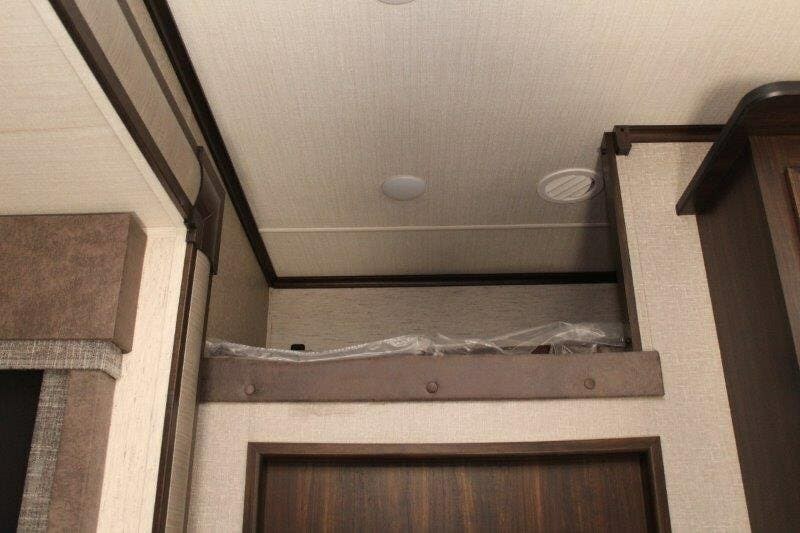 There is a loft for one adult at the front of the cargo area, or the kids may want to draw straws for it to hang out. 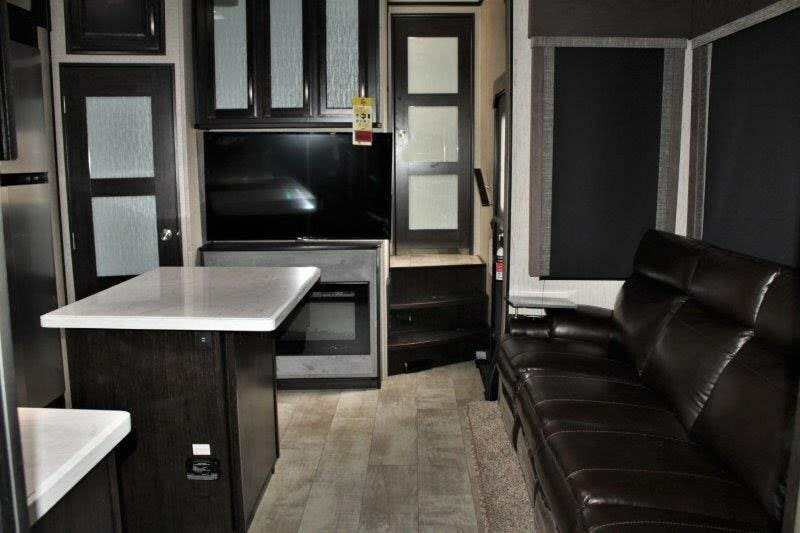 There is washer and dryer prepped space if you choose to add the appliances, and a LED TV for enjoyment. 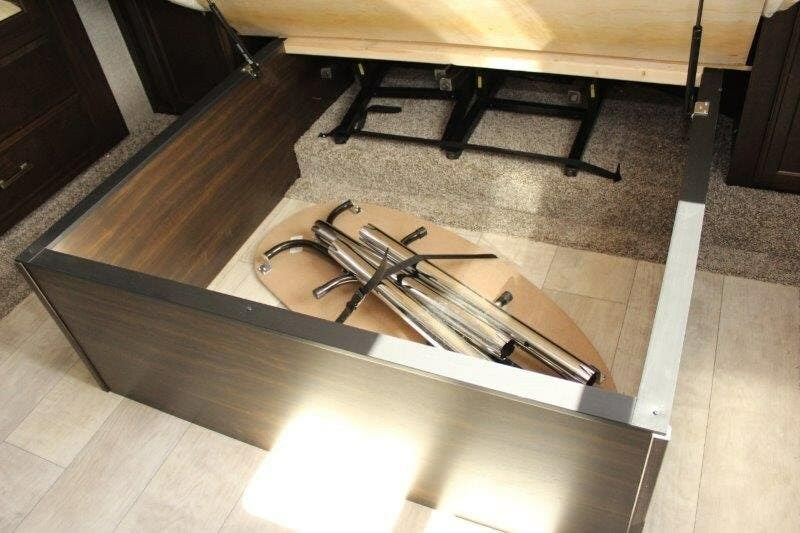 You may even choose to add one or two optional Happi-Jac rollover sofas with top bed if you expect to have overnight guests. 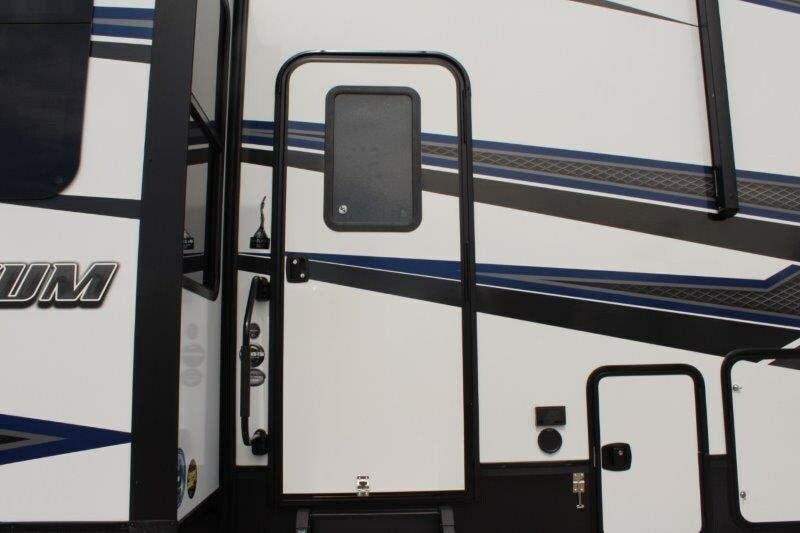 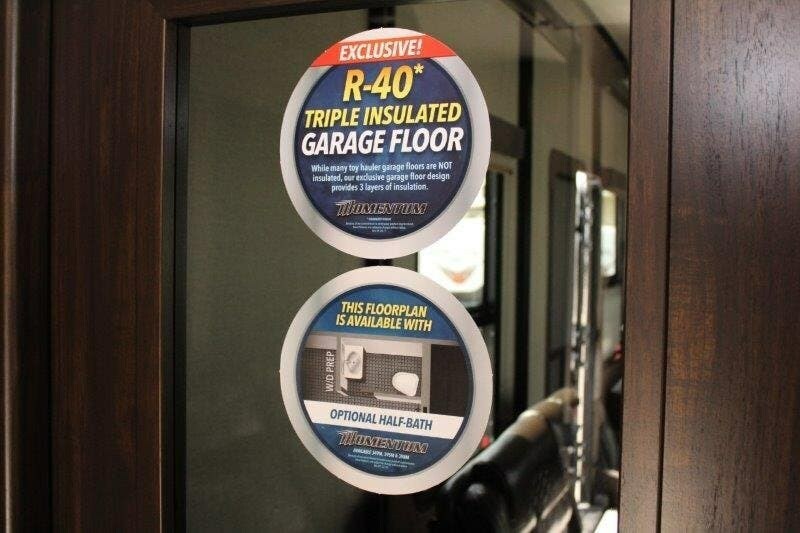 There is also a side man door in the garage space for easy access. 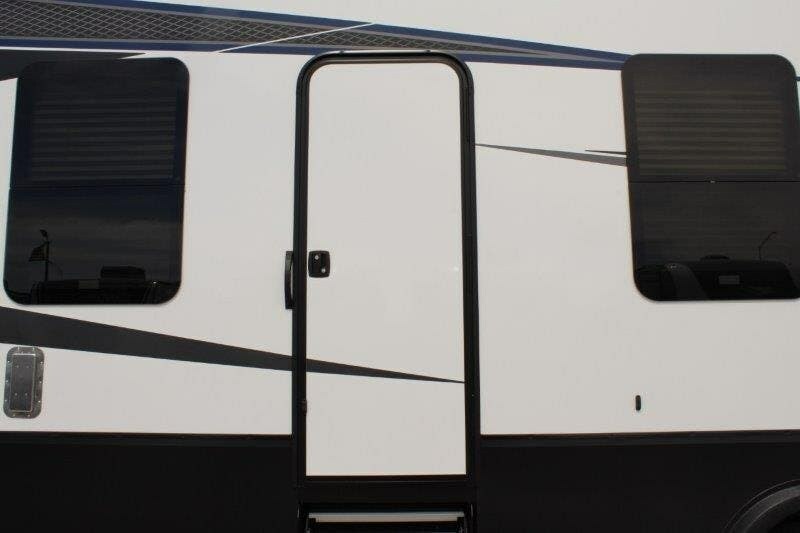 You may even choose to set up the patio on the ramp door.Enter the main living area through a sliding door, or through the main side entrance. 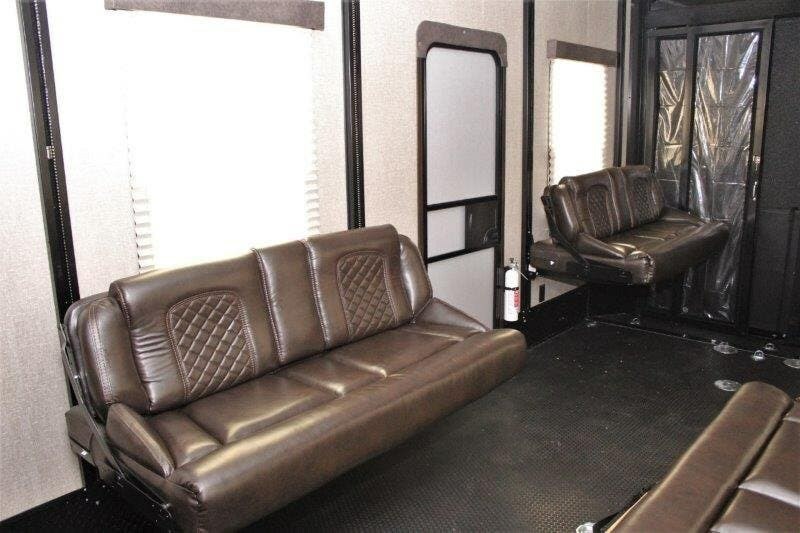 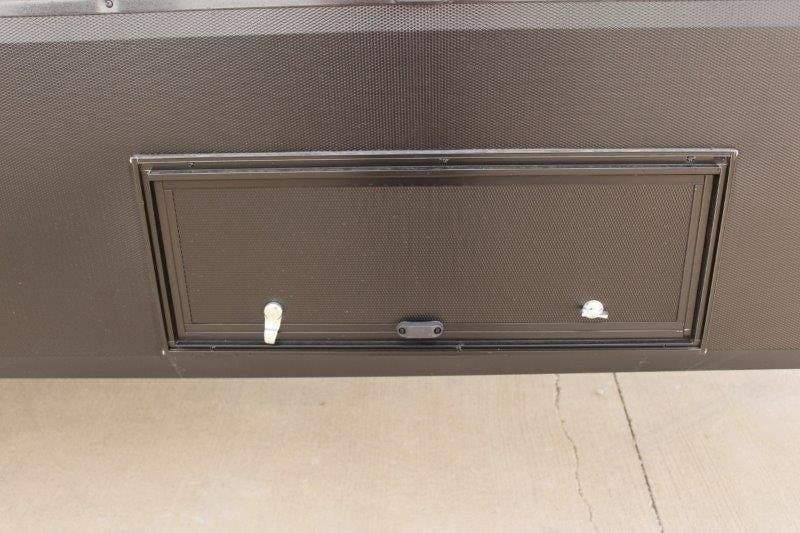 Once inside you will find a large slide out 4-seat sofa with stowable table along the curb side. 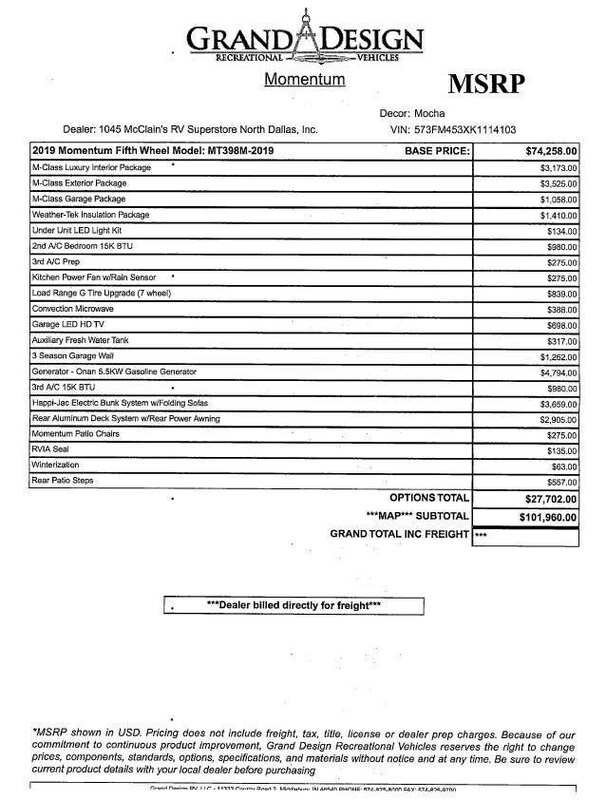 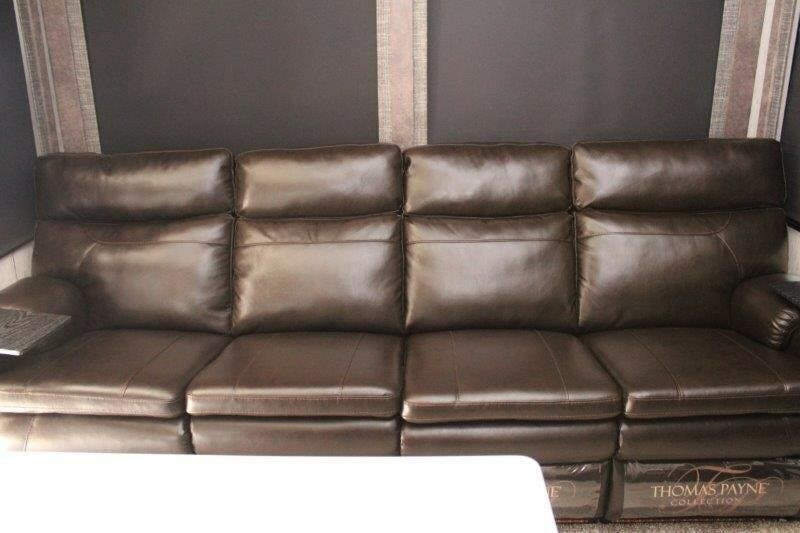 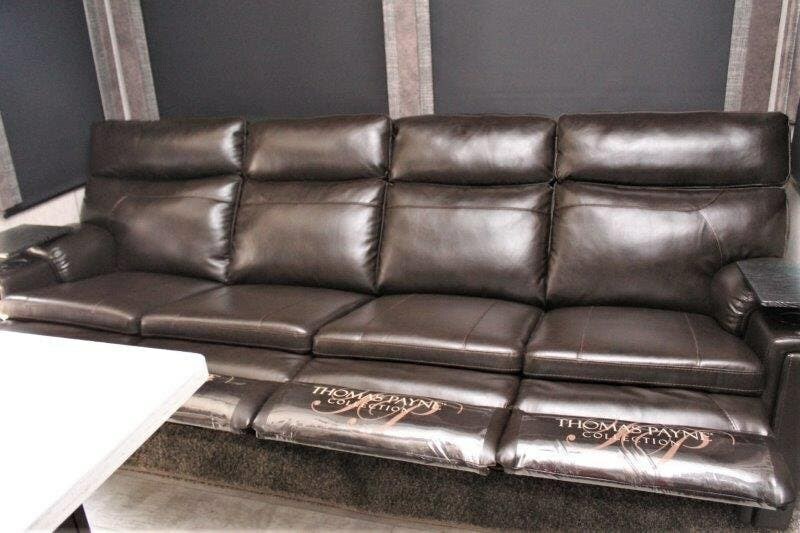 You can choose a 4-seat sofa recliners/dinette option, or an optional smaller sofa recliner with a smaller dinette as well. 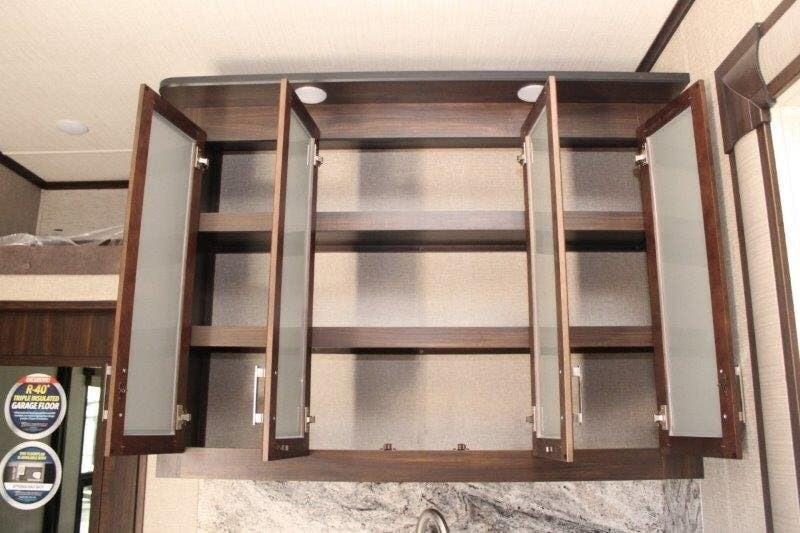 There is an entertainment center along the angled bath wall featuring a LED TV with fireplace below. 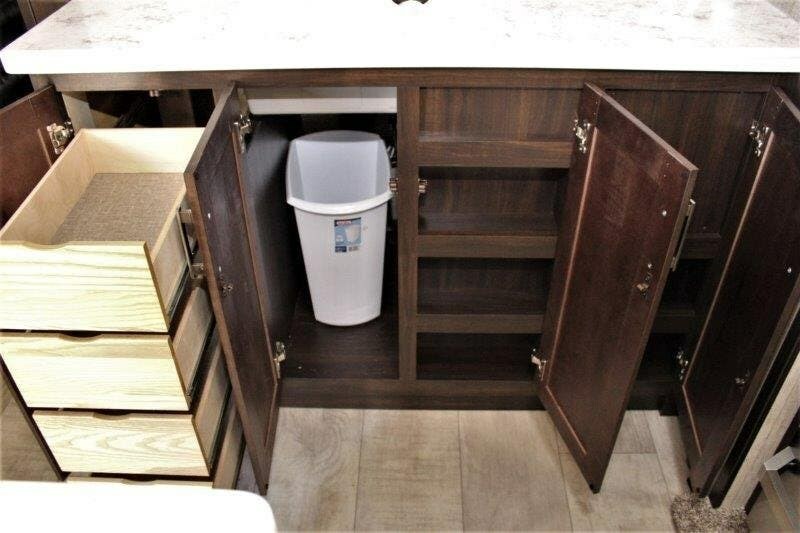 A nice pantry is also along the same wall and provides a lot of storage for canned and dry goods.You can easily cook up meals and snacks to keep everyone fueled all weekend long with an 18 cu. 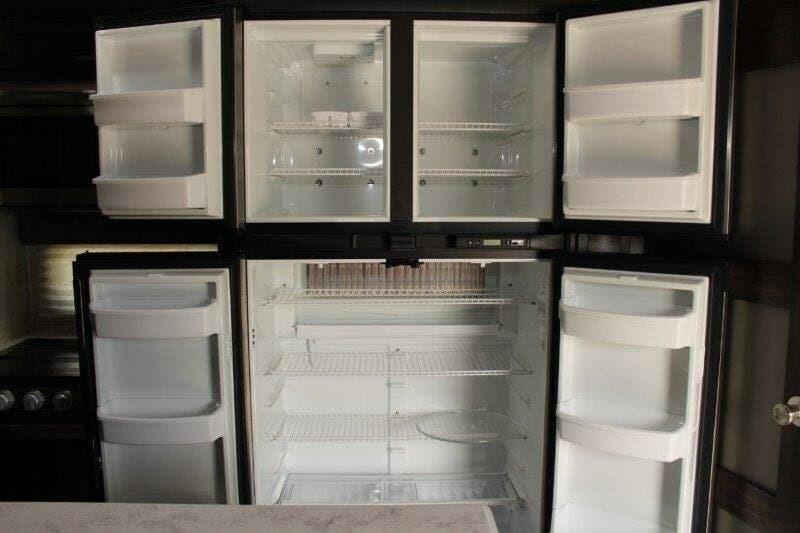 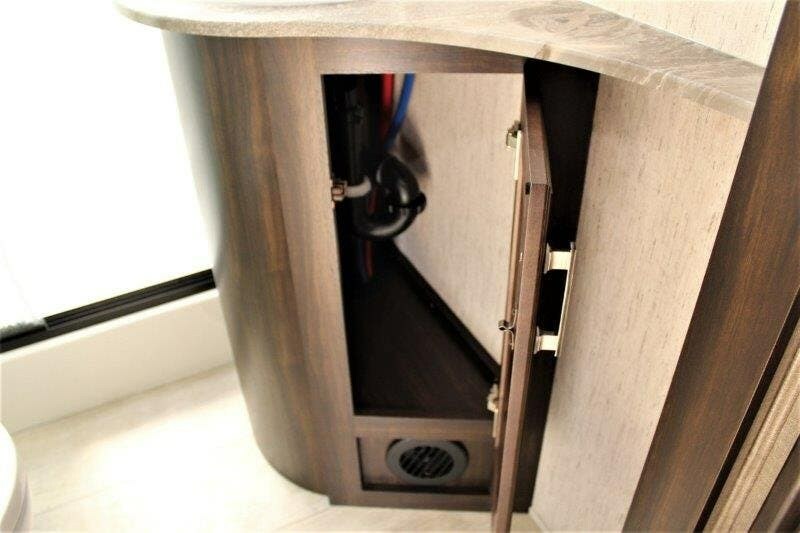 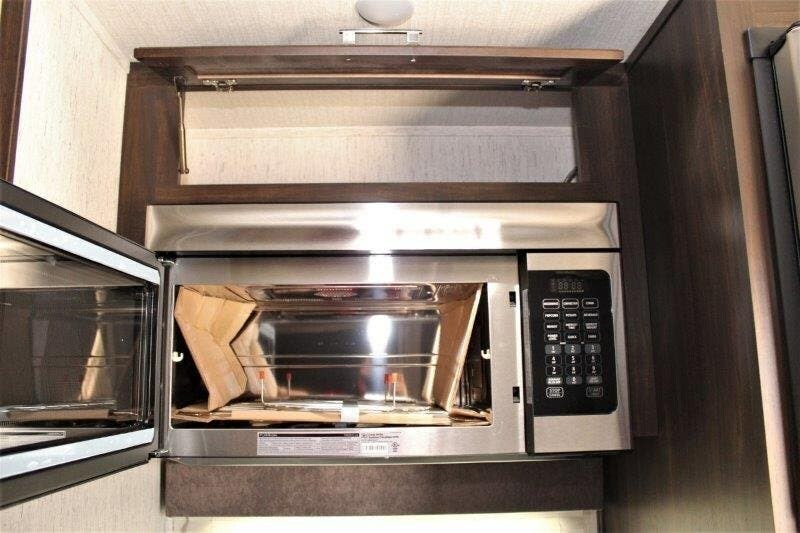 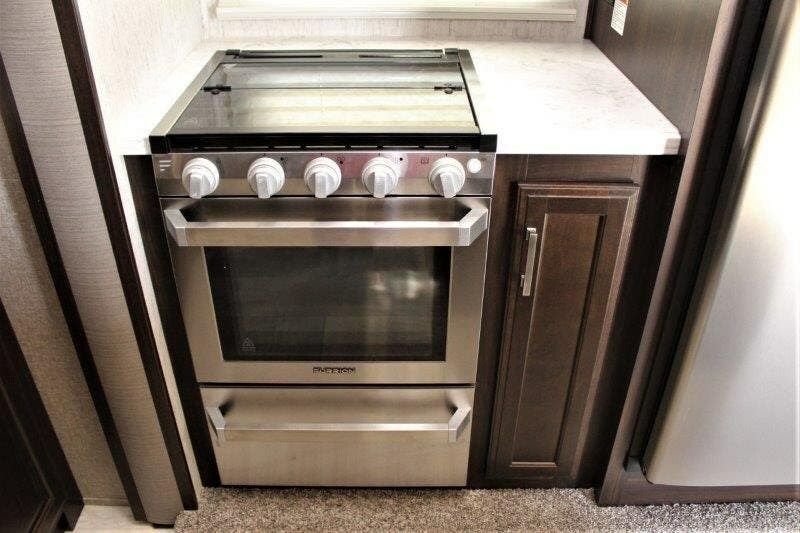 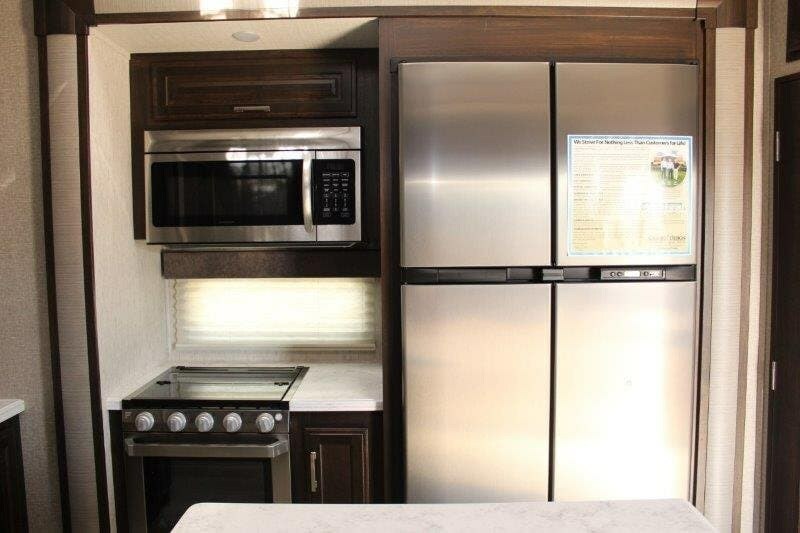 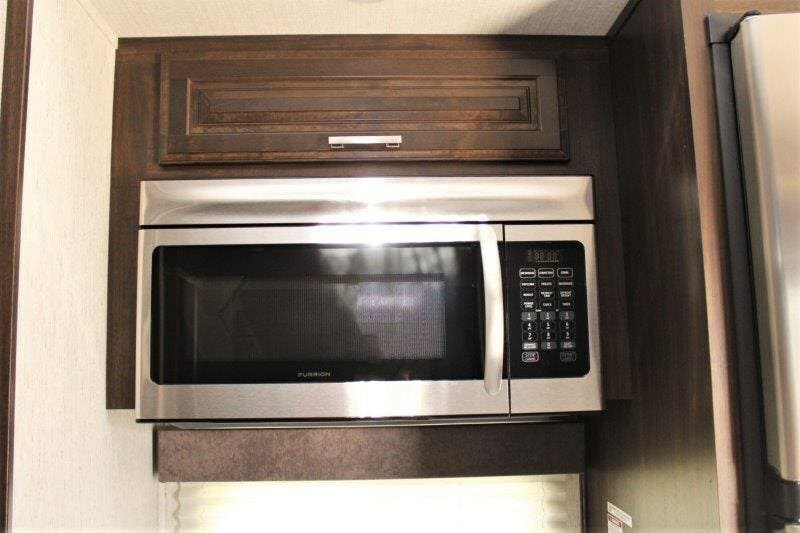 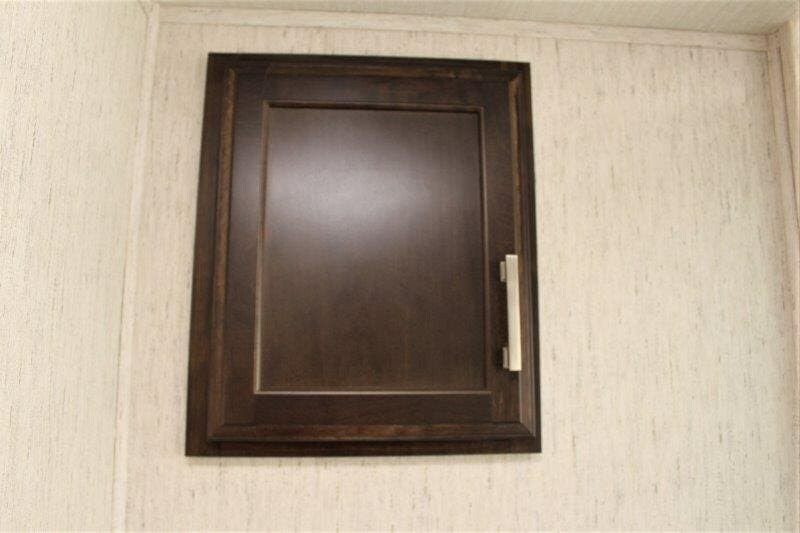 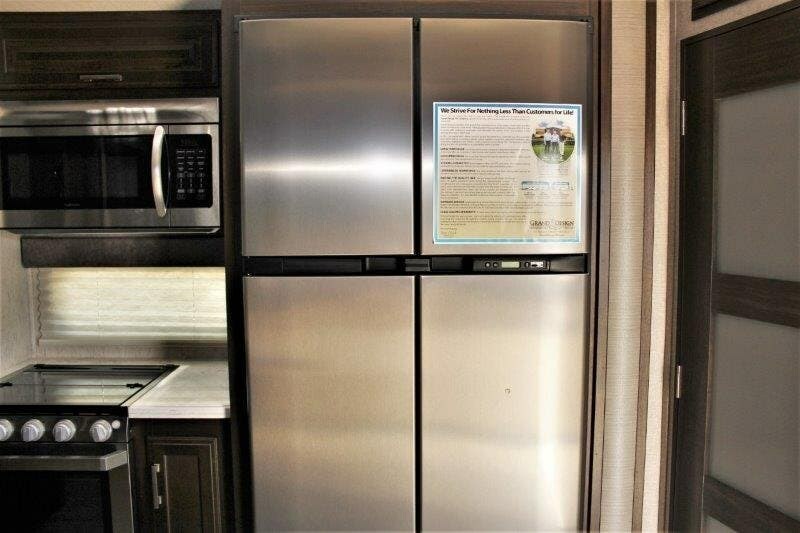 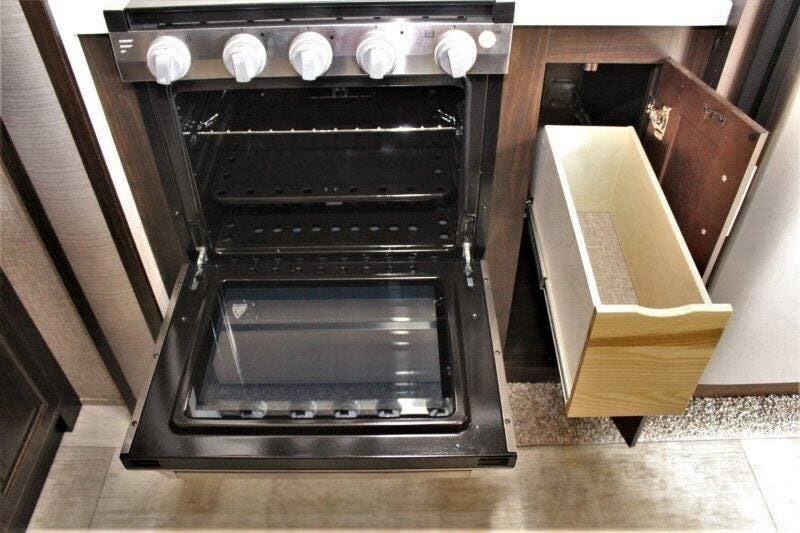 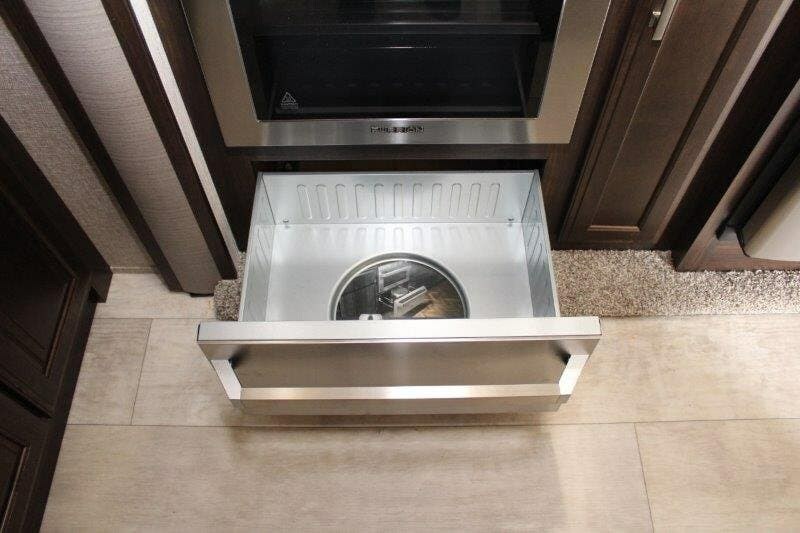 ft. refrigerator for your cold stuff, and a three burner range with overhead microwave oven inside a slide out. 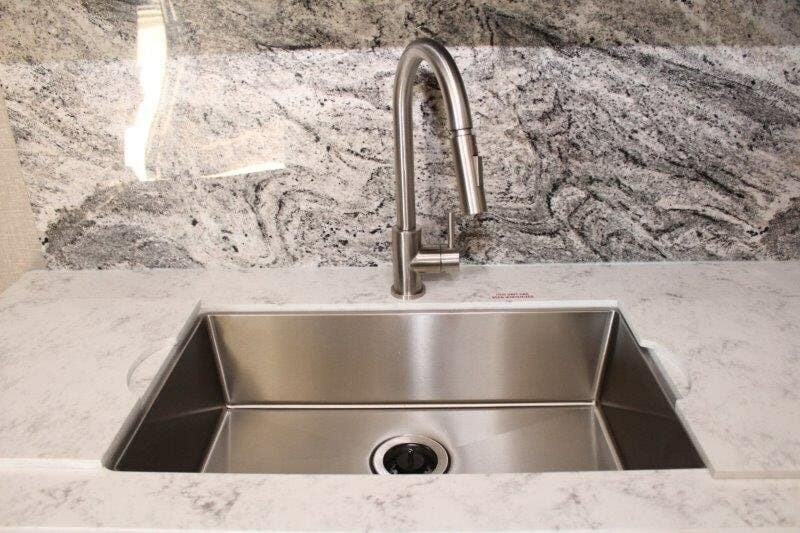 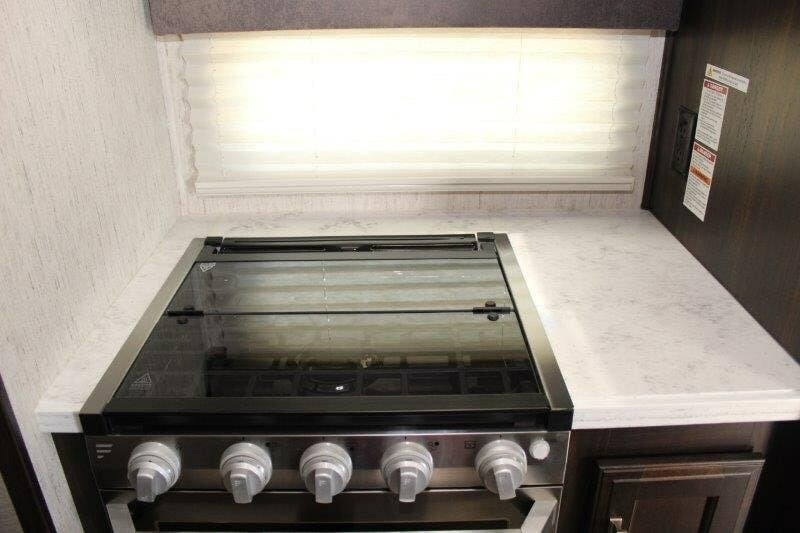 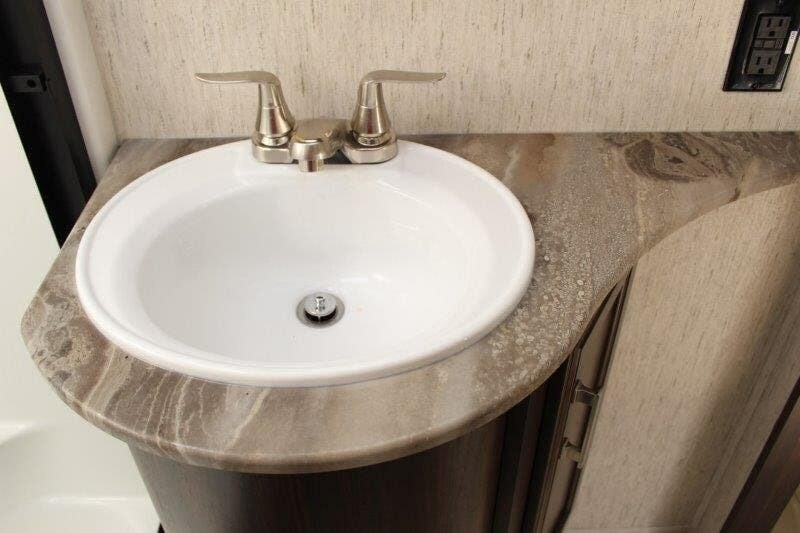 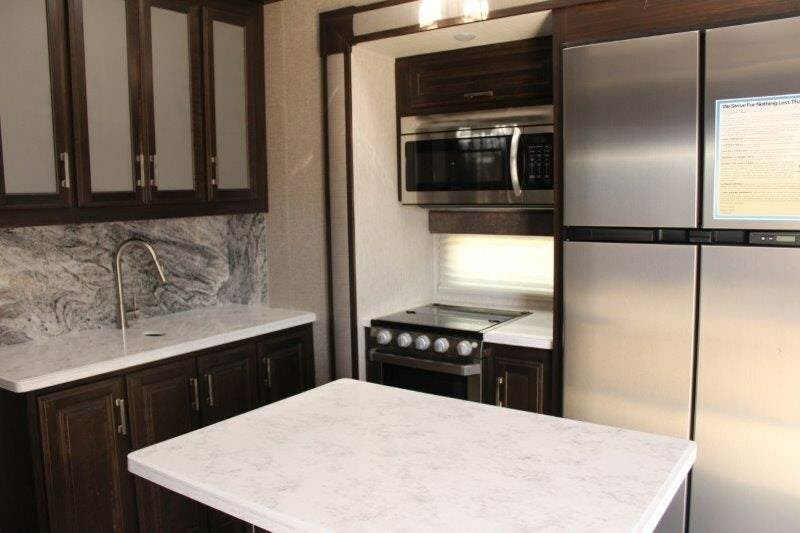 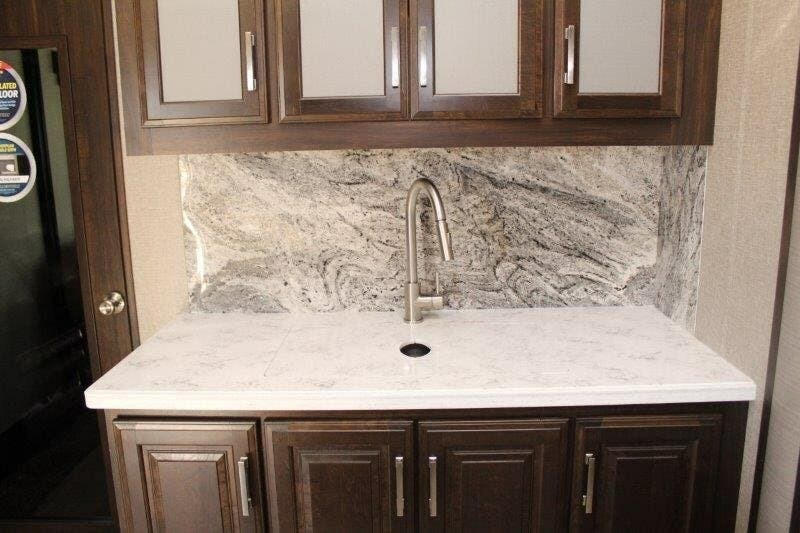 There is a counter area with large sink along the interior wall which offers added overhead cabinet space, plus more. 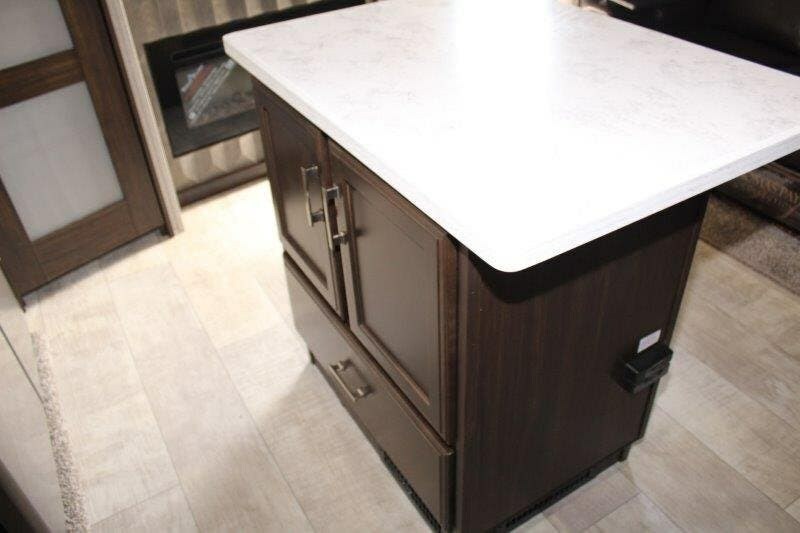 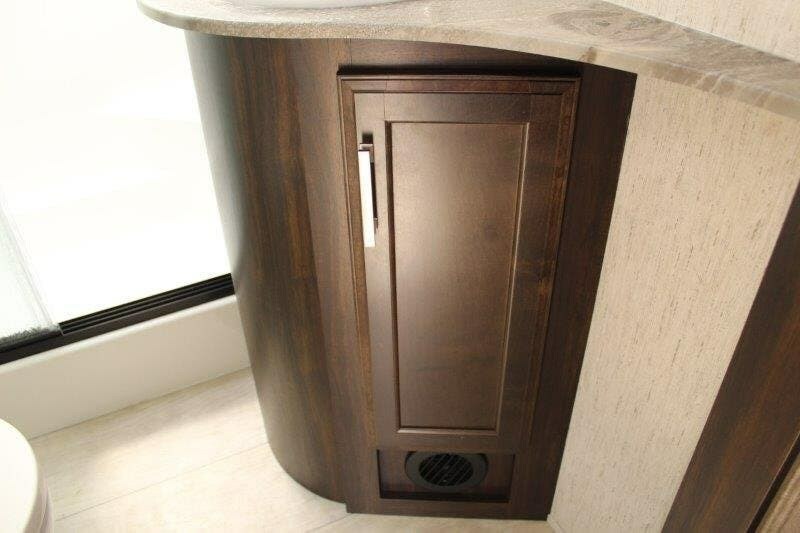 There is also a handy kitchen island for food prep and serving space too.Head up the steps to the right of the entry door and find a complete bath on your left. 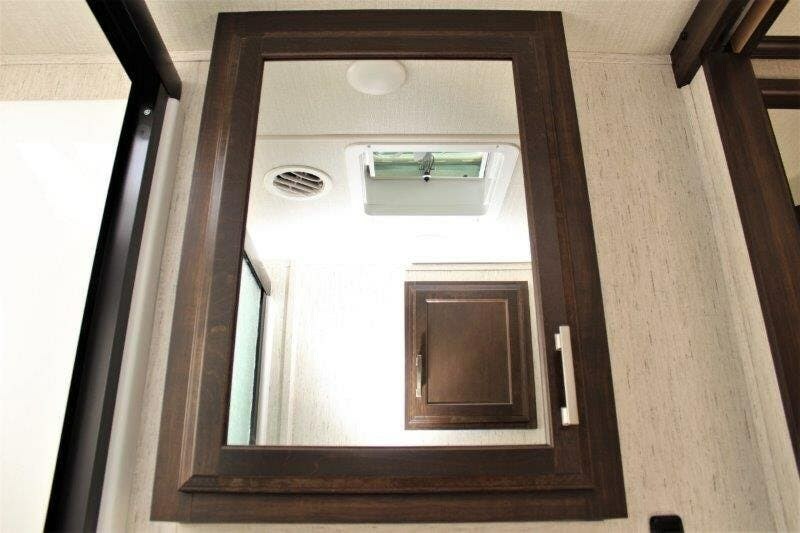 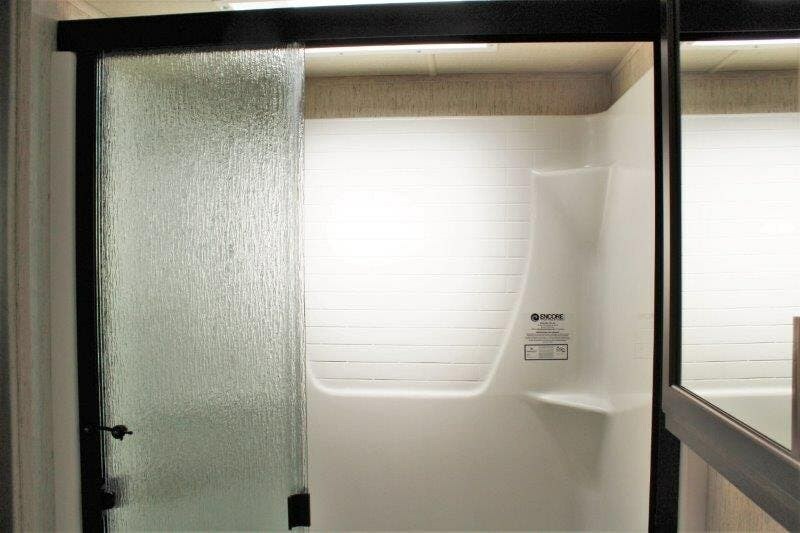 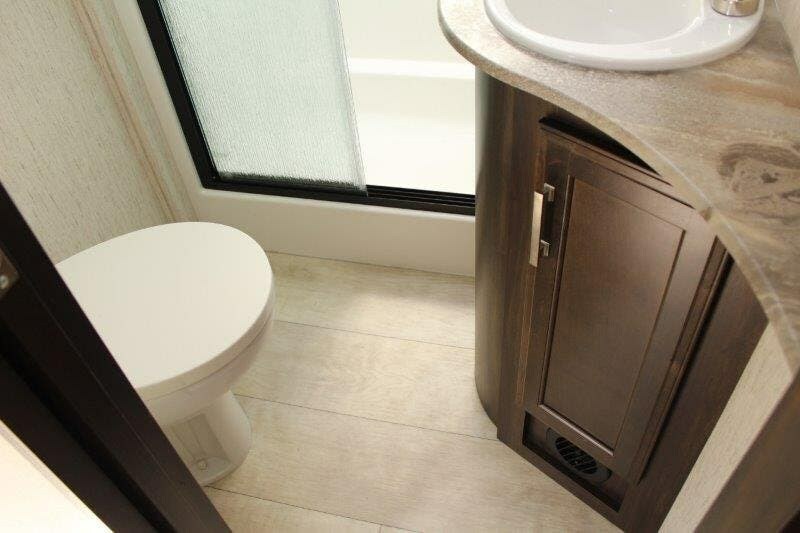 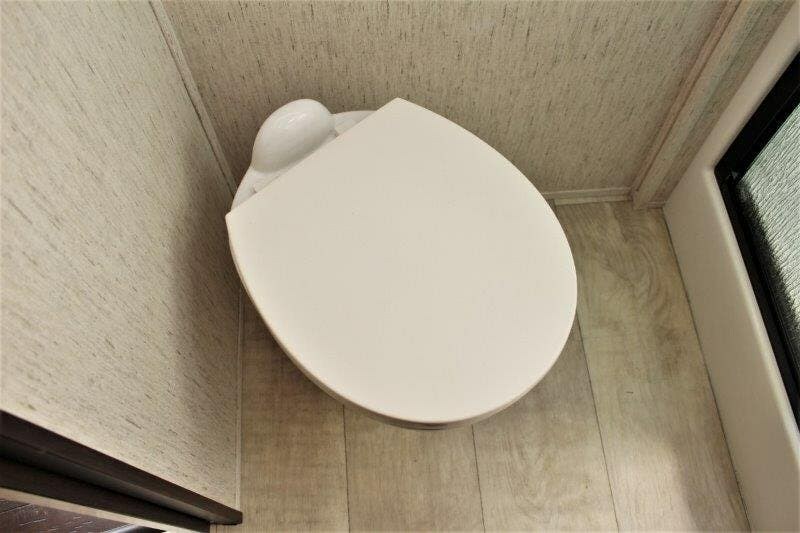 There is a shower with seat and skylight, a toilet and vanity sink, plus overhead storage.The front bedroom offers a queen or optional king size bed with nightstands on either side. 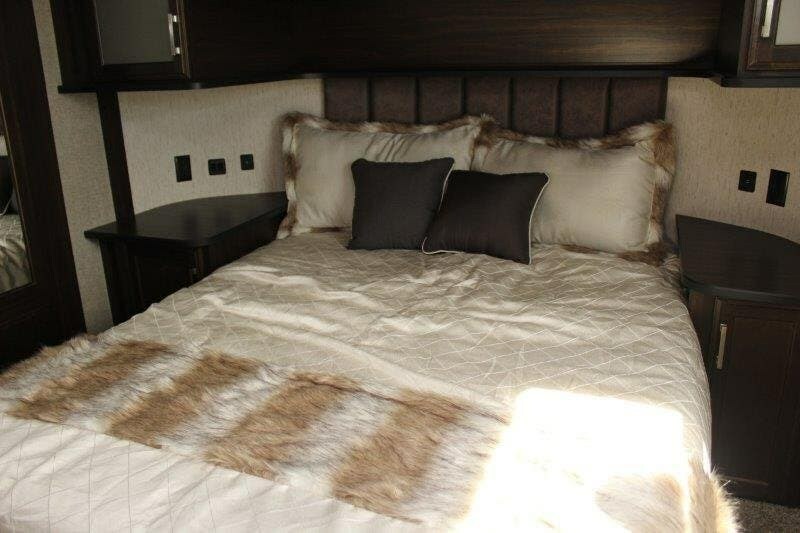 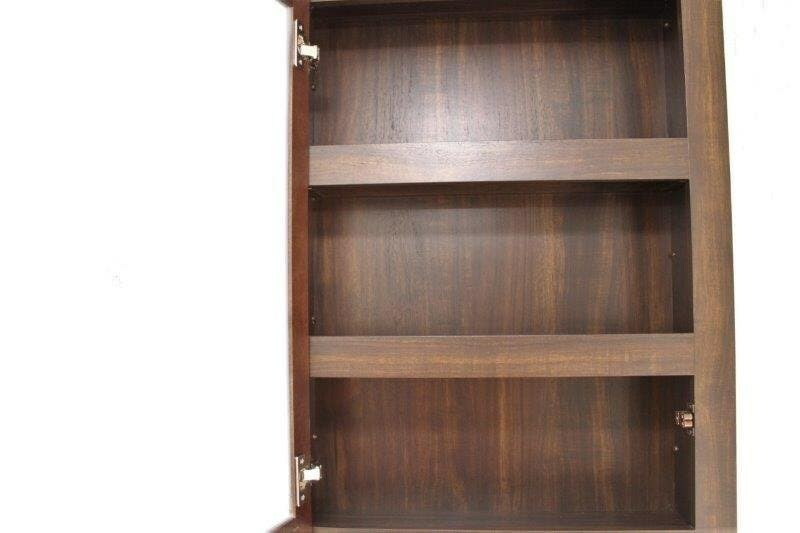 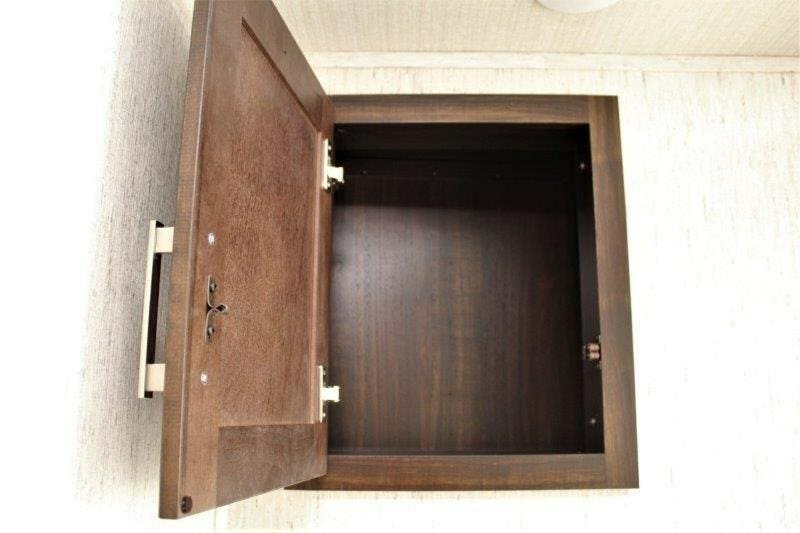 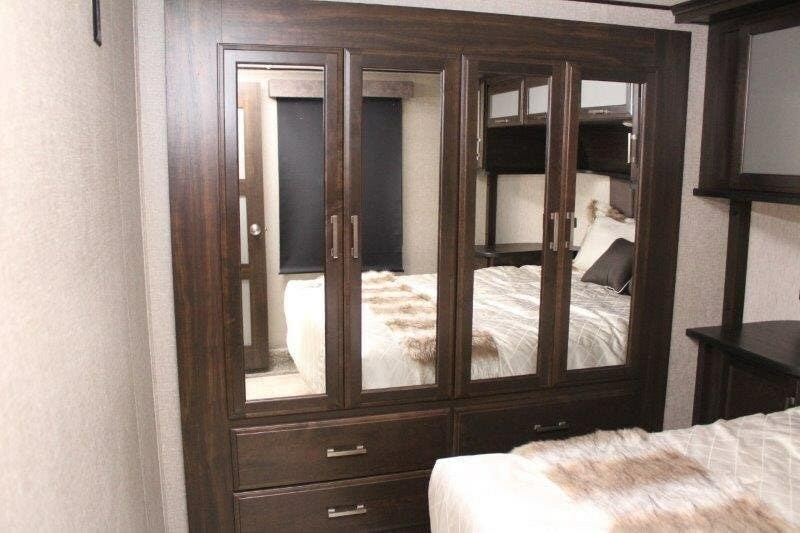 There is a slide out wardrobe with drawers for him and her along the road side, plus so much more! 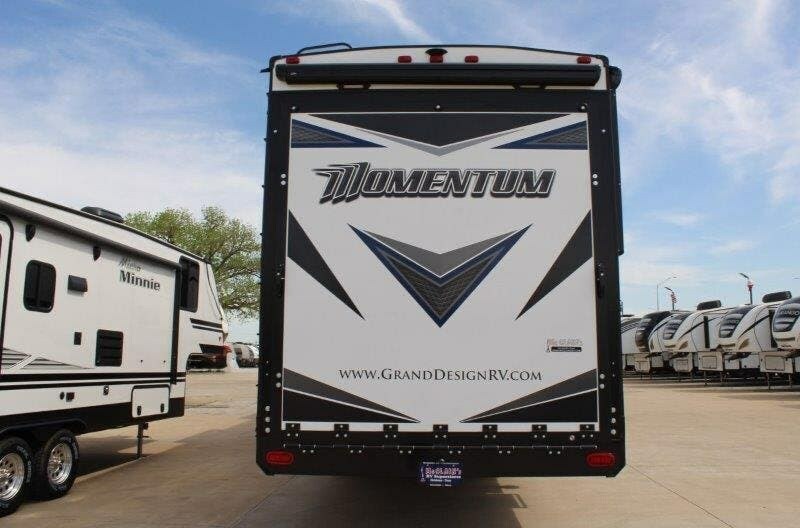 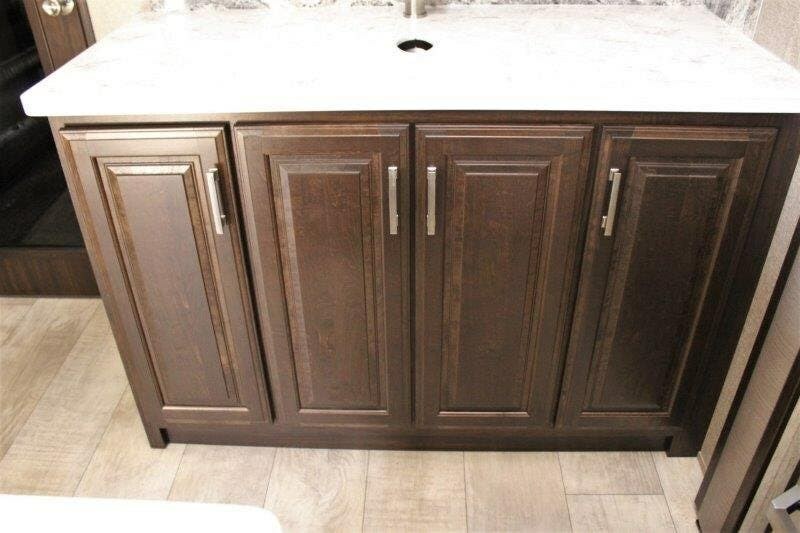 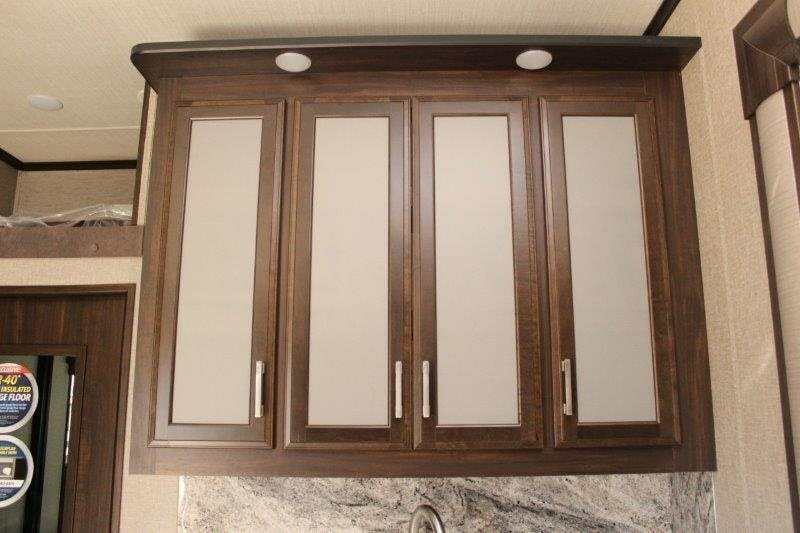 Check out Stock # 90492 - 2019 Grand Design Momentum on granddesignsource.com!